Late Wednesday, it was revealed that State Senate Majority Leader Scott Fitzgerald (R-Juneau) and Assembly Speaker Robin Vos (R-Rochester) had secretly signed contracts with two law firms to utilize hundreds of thousands of dollars of taxpayer money to pay for the defense of unconstitutional, rigged voter maps created in secrecy by GOP leaders in 2011. This is the most blatant example of "taxation without representation" in every sense of that famous phrase. There was no public input into this secret decision, which will further burden Wisconsin taxpayers, who have already been forced to shell out more than $2.1 million to create and defend the maps of state legislative districts in Wisconsin. 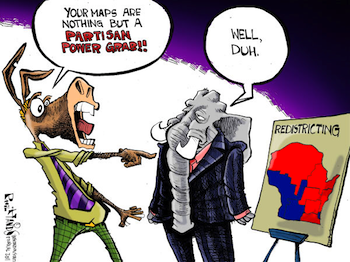 They were drawn in complete secrecy in what was considered to be the most hyper-partisan Republican gerrymander in the nation in 2011 and one of the five most hyper-partisan redistricting processes in American history. Last November, a federal court panel struck down Wisconsin's 2011 voter maps as unconstitutional for excessive partisanship. That decision is very likely to be appealed to the Supreme Court of the United States soon. In the meantime, the federal court panel has ordered the Republican-controlled Wisconsin Legislature to redraw the state's legislative districts in a less partisan and more transparent way before November 1, 2017 – in time for the 2018 elections. The expenditure of taxpayer dollars to defend the 2011 gerrymander serves no legitimate public purpose. The Wisconsin Attorney General, Brad Schimel, and his cohort of taxpayer-paid lawyers at the Department of Justice are already on board to defend the unconstitutional 2011 voter maps. The unilateral decision to hire one Chicago and Washington, D.C.-based law firm for at least $175,000 and another Wisconsin-based GOP law firm at $300 an hour (with no cap) was made by Fitzgerald and Vos with no public input. Legal costs could soar at our expense. Wisconsin citizens need to contact Scott Fitzgerald and Robin Vos and their own State Senator and State Representative and demand that taxpayer funds not be utilized to defend unconstitutional, hyper-partisan voter maps. Many of you have done this in the last several weeks and we know that your voices are generating considerable concern and consternation under the Capitol dome. Secondly, we must demand that the Legislature quickly hold public hearings and then consider and bring to a vote Senate Bill 13/Assembly Bill 44 – bipartisan legislation introduced within the past month in the Legislature by State Senator Dave Hansen (D-Green Bay). This legislation, introduced for the third consecutive legislative session, is modeled after the Iowa redistricting process which was adopted by and enacted into law in 1980 by a Republican Governor (Robert Ray) and a Republican-controlled Iowa State Senate and House. Why? Because the Governor and the Legislature came to the realization that a non-partisan system, in which a professional state agency should draw the maps (carefully following strict, specific criteria) and not partisan legislators, would have the support and confidence of the citizens of Iowa. In Wisconsin currently, public interest and concern is ignored in favor of narrow, selfish, partisan considerations. It is imperative that all of us contact both our State Senator and our State Representative and demand that they co-sponsor and support Senate Bill 13/Assembly Bill 44. Thus far, the legislation has the support of 13 State Senators (all Democrats) and 33 State Representatives, including Republican Todd Novak of Dodgeville. We need to pressure Republicans to break rank with their leaders and do the right thing for voters. If you are not sure who your state legislators are, go here. Please share with us any response you may receive. Also, please let us know if you have contacted your State Senator and State Representative and they do not respond. And finally, if you have not done so already, please sign our on-line petition in support of the Iowa-model legislation. We are nearing 3,000 signatures and want to add to that total in the weeks ahead. Your voices are making a difference. Keep applying pressure! Taxpayers to be Fleeced by GOP Legislative Leaders for Defense of Unconstitutional, Rigged Voter Maps Tweet this!